"4 Ways To Look Hot While You're Watching The Super Bowl." "A Girl's Guide to Understanding Football." "Girlfriend, Are You Ready For Some Football?" These are the sorts of headlines that make me want to gag, potentially cry, and definitely bang my head against something hard, especially into the lead-up to Super Bowl Sunday, which is as close to a religious holiday as I celebrate. Sundays in general are sacred for me. Sunday is the day I make gravy and meatballs. (You might call it "tomato sauce," but to an Italian-American it's gravy). It's the day I get my nails done. It is also, and most significantly, the day I watch football. My interests might seem contradictory to what we're told the ladies are supposed to like, but for me this is the way it's always been. I've honestly never considered it all that remarkable. I'm a woman who breathes, eats, sleeps, and lives football. It's a huge part of my life. During football season, the most wonderful time of the year, I forego Saturday night benders in preparation for eventful Sundays. This is convenient since I'm now over 25 years old and can't hang like I used to. But even if I could still party 'til 4 a.m. with only the faintest hint of a hangover the next day, Sundays would still be reserved exclusively for watching NFL players get smacked around on the field. I can throw a football pretty damn well, too. I also manage four Fantasy Football teams, though I'll admit that four teams is entirely too many to handle for one season. (Did I mention I also love gambling?) In three of my leagues, I'm the only woman. It's hard to believe more women aren't already into football, or into making their own fantasy teams. Every time one of my girlfriends joins a fantasy league, they're hooked. How do we live in a culture that worships football, yet teaches women it isn't for them? You probably think it was my dad who instilled a love for what I am certain is America's best sport. 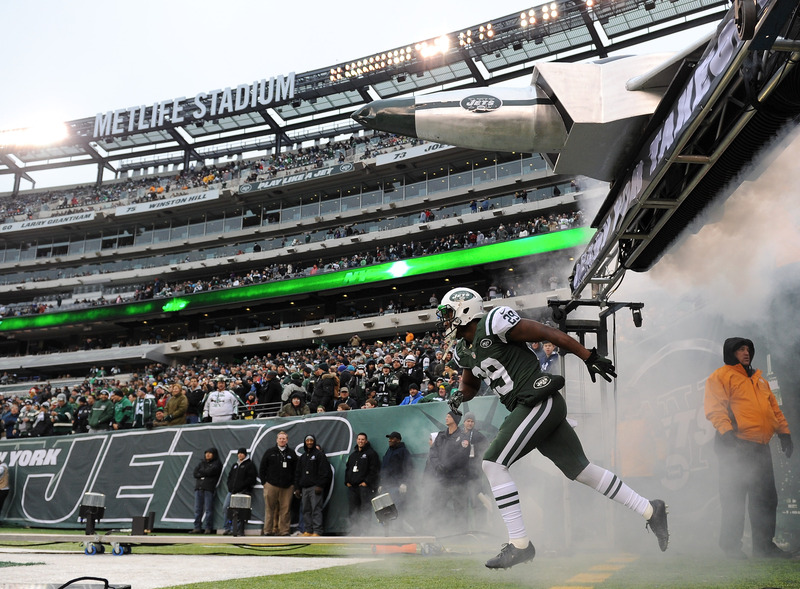 (Have you ever been to a football tailgate, in particular a Jets tailgate? Nothing that fun has ever happened in the parking lot of Yankee Stadium.) Actually, my father and I have never even been to a game together. And I can assure you that my mom has nothing to do with my love for the game. If her life depended on it, she couldn't tell you what it means to convert on a third down. It's kind of like the time I made her watch an episode of "The Walking Dead" and when it was over, she responded, "That was a strange movie." But I digress. I used to get bundled up for Jets games as a child. I was one of those lucky kids who lived just 10 miles from Giants Stadium. My uncle regularly brought myself, my mom, and my cousins to live sporting events. My mom was always a good sport about attending even though she couldn't care less what happened on the field. These were the family outings I most looked forward to as a child. It's easy to see why that stadium's become a second home. But things are different now. While I'd love to catch a game with my family, my usual Sunday suspects have changed. It's me, my friends, and the local dive bar. Or it's the frozen 8-pack of Fatburgers and three bags of chips (that we'll never eat) that were scooped up for a 3+ hour long tailgate. It's that stretch of time spent outside of an NFL stadium when afternoon sun fades into a chilly night, or at the bar knowing it’ll be dark before I ever even think of leaving, that really make Sunday worth looking forward to. With my friends, surrounded by all the yelling, the booze, and the hoopla, is where I feel most comfortable. It's where I know I can be me. If you know me, that means blurting out random words in anything but my "indoor voice." I'm so into it that it's affected my travel plans. A few years back I became less interested in venturing to international destinations, preferring instead random places across the continental U.S. No time like the present to explore the American frontier, right?! Actually, I have a friend conveniently located in Denver, and flights were pretty cheap the weekend the Jets played the Broncos. Let’s just say I’ve traveled near and far for a good football game, and more than a few bad ones. I even drove out of my way when I should have been headed to the airport to catch a glimpse of Qualcomm Stadium in San Diego. What can I say? I'm hooked. But most games during football season are spent in one place, and it's where I grew up in New Jersey. Friends tease me. They can't understand why I head back to my hometown almost every weekend. And definitely every Sunday. But that's where I want to be and that's where the people I love most are. It's where my friends who love football are. And even the ones who love the Jets. (No, I’m not the only one.) It's also where I'm proud to say Super Bowl XLVIII will be played, no matter how cold or snowy it is. Football is a way of life for me. And it's a life I've always wanted to live. The sense of community inside my local bar or at any NFL tailgate is a feeling unlike any other Monday-Saturday. Football brings people together in ways you'd never imagine. And so Sunday has become my home.